This fragrance was released on the occasion of the re-opening of the flagship store at East 57th Street, New York. Nice - and that's meant nicely this time. Once again I try to judge the fragrance from a different perspective. Does Chanel already have this in their normal assortment? No they don't, so that's a plus. Expands the customer base. Neither does it flower like Chance or Coco Mademoiselle, nor is it exhausting like N°19 or Cristalle. It also doesn't buzz like Coco or N°5. 1957 doesn't look back to old classics, but continues the clean Chanel DNA skilfully. No - because he really isn't unpleasant or takes getting used to. When it comes to fragrances that are considered powdery, I often flinch first, because either they are too one-sidedly iridescent for me - although I don't like irises to be inflationary - or the air stays away because I have the feeling that I have sneezed into a powder can or even worse into a packet of detergent. Neither of them I can accuse in 1957 and therefore I describe this rather dry note not powdery but rather silky. Do you have to have this in your collection? to access it. 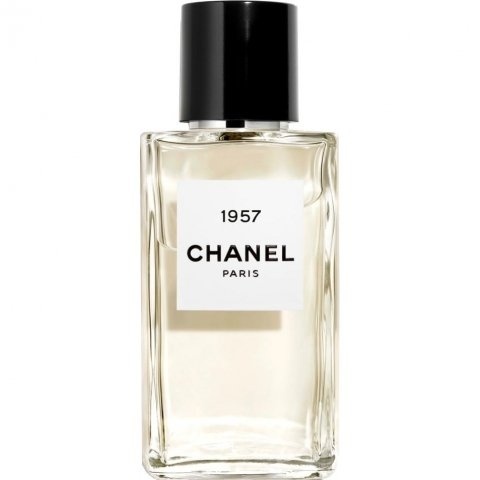 1957 is bright, friendly, considerate, calming, uncomplicated, flattering and yes, the fragrance will end up on my wish list, even if I don't want it to give rise to any very romantic feelings and I don't see it as the ultimate in Chanel's portfolio either. I like him and that's enough, because I'm my own yardstick. As is well known, the term "superfluous" is often used as a nice word in fragrance evaluations. This time I mean it literally. Not only do I like the fragrance itself, I also like its restraint in terms of durability and sillage, and in terms of classification I simply assume that it was not explicitly presented as unisex, but that the subject was simply dropped under the table. It doesn't matter who wears it, as long as you feel comfortable with it. Once again I think: Olivier Polge did everything right. I am fully aware that with the assessment that this white musk fragrance is not the ultimate of winter 2018 / 2019, I will attract the wrath of quite a few women, and of course I am also aware that I don't have to presume to evaluate a fragrance good or bad that doesn't correspond to my preferences, so I give it the note that's up there from me and therefore I assure all those who now feel triggered: "I'm really really sorry, and I apologize unconditionally (...), I offer a complete and complete revocation if necessary. The accusations actually lacked any factual basis, and it was in no way a fair comment and thus stemmed from pure malice. And I deeply regret the misfortune that my comment could have caused some - or their families - to feel. And I hereby assure you that I will never again allow myself to make such a mistake, either now or in the future." (Quote somewhat freely from "A fish named Wanda"). Seriously: somehow the fragrance is already good and reminds me strongly of the (probably) much more expensive White of Puredistance, which also features white musk with a honey-sweet note, but in this one a bit more refined and complex, in this one a bit more striking. But is it even necessary to combine powdery musk with powdery iris root and "powdery notes" (see above)? Obviously already. All right then is a fine sharp-floral note, which can be smelled on the one hand by the allegedly contained neroli oil (which you can't smell so clearly in the sense of "yes, there's neroli in it", but rather in the sense of "yes, sure, there's something about neroli up there, so it must be that light fruity floral note I smell there"), on the other hand by the allegedly contained bergamot oil (you know....) could be caused. If you throw it all together like this, 1957 will bring out a fragrance that many (especially women?) will like (musk, iris, honey) and which I really don't have to smell of a man (Please save your comments on the gender theme of perfume: Thank you! ), but which probably smells quite delightful on a woman (Please save it...: Oh, forget it!). Somehow I had to spontaneously think of the little black one, which allegedly belongs to a woman's basic wardrobe (which is very beautiful) and which, contrasting here, found an olfkatorischen reflection as a small white fragrance miracle. Could be essential. I'll probably even like it at some point. It is the year in which Gabrielle Chanel arrives in the USA again great, makes a name for herself again, brings a completely new line into the American perfume world. Coco's personality, her fashion style and her fragrances - No. 5 inspired Americans enormously in the 1920s - embody for Americans the typical French elegance, a way of life that is characterized by naturalness and lightness and unbridled enjoyment of life. Avant-garde, free, life-affirming, headstrong, strong and creative - that's French and that's Coco Chanel for many as well; and that's also what her perfumes stand for. The name 1957 is also a numbers game. No. 19 as Coco's global success and no. 57 as the house number that houses the largest Chanel retail store in the United States. For Chanel, 1957 is like a bridge between American perfumes and the incomparable character of French perfume. The fragrance is more and more dominated by white musk after its citric-herbal, slightly lavendery attack. Perfumer Olivier Polge uses eight different types of white musk oils in this eau de parfum. As dominant and complex as these musk notes are, as unusually bright, light and airy, tender and lively they seem to me. They never get too much, never overwhelmingly loud. They are iridescent, i.e. of ever changing colourfulness. They appear one after the other sometimes lighter, sometimes darker tinted, sometimes berryy-warm, then malty-sweet, sometimes restrained, then again doing themselves out. It is for me a single, whole new note, this kind of subtle musk that breaks down very, very finely over the course of hours. But all this happens very quietly; you have to smell it very carefully to perceive these different nuances. The heart note then clearly shows powdery tones of a mild iris root. Also Neroli, skin and juice of strong oranges, is perceptible. As if pieces of bitter orange had been dipped in forest honey to soothe the bitterness and bring a noble, liquid sweetness into play. The forest honey drips from the orange pieces onto the flower bed. That's how I feel. Thereby slight hints of ginger rise into my nose... possibly cardamom. As already mentioned at the beginning, the smell of cedar wood is perceptible, not loud, not dark and wild. These are rather soft, fresh woody notes, which want to have a discreet say and are only kindled by the warm spring winds mentioned at the beginning. If I wanted to characterize the character of 1957, I'd say it's a citrus-fresh, powdery-clean, clear, vibrantly changing fragrance, full of soft surprises. Very pleasant, a distinct scent of well-being, which for me fits perfectly into the approaching spring. By the way, the scent is wearable for women and men, it is said; I imagine it rather on a woman. I'd like to compare it to the legendary white pearl necklace by Coco. Just as every single pearl is unique, every moment in the 6 to 7 hours or so that the scent accompanies me after two or three powerful sprays is something special. And maybe men like Coco's white pearls too. As is so often the case in life, my experience, also my fragrance experience, depends on my own perception, on my imagination, my openness, my current mood and my sensitivity. The scent chords can be heard as an overall chord, then it is a single sound. But if I listen attentively and analytically, as with a polyphonic piece of music, I will discover more, enjoy more. Because the volume in this piece called 1957 moves between pianissimo, piano and mezzoforte. I would like to thank my dear fragrance friend Schwälbchen very much for this experience with 1957, which again inspired me to write. Spring can't really start any better than this. With this enchanting companion you are greeted very well. The scent makes me really good mood and joy! Here, one has to think directly of a walk, past lush meadows, the dew is still in the air, it is slightly fresh but no longer cold. Along the water, everything is quiet and peaceful. Chanel has really developed a great fragrance here. I hadn't even imagined him so beautifully, so the surprise is even nicer! The fragrance starts right at the beginning with an incredibly fresh and clean iris. Nothing here is dusty or dry. Here the thought of water comes to my mind. Like a rippling stream or a waterfall. The scent is also slightly cool for me. Very fascinating! I smelled something like that at the Montale So Iris but the Chanel is even fresher, cooler, cleaner and more powdery. Like iris powder which is poured into water. A great cooling and refreshment but not in the cheap way but very high quality and noble! I can't smell the honey but I think it's maybe responsible for the pleasant sweetness. Everything fits together perfectly! I am really very enthusiastic and very happy with the fragrance. I'm already really looking forward to spring and summer, because the scent fits in best for me. But also to wear so wonderfully, a smile is preprogrammed :) In addition, the fragrance also has a super durability on my skin and the Sillage is also not to be despised. One more deep breath, right over the back of my hand. Elegant, clean. Clean, elegant. No matter how often I smell it, these two attributes come to mind. That may not seem like much. But sometimes it is precisely the reduction that has its appeal. At the first sprayer I met a beautiful musk cloud. The Chanel consultant explained that there are many different types of musk, finely woven together, which is why the fragrance also undergoes a quite large development. Musk always makes me think about Rodriguez perfumes. This one's got nothing to do with it. No, this one has a whole different DNA. Definitely Chanel. And indeed, there is a development from the first spray to the base note, albeit gentle and quiet. Because this does not make any statements here, at least not through a room-filling presence. This one's more of a noble restraint. I'm still pondering what the fragrance reminds me of now that I've arrived at the base. No, it's not new scents pouring out towards me. The fragrance is not particularly flowery, not woody, and certainly not fruity. Rather creamy. A fragrance that looks beautiful, noble, valuable and above all clean. He radiates a calm elegance and being well-groomed. A fragrance that doesn't disturb. That sounds a bit boring now, but I mean it sincerely positive. Sometimes there are days (and there are more and more days) when I don't like strong, sophisticated perfumes. I like to scent myself, but I don't like to perfume myself. The overdose of perfume of my colleagues irritates me for a whole appointment. While we are talking about structures, processes and interfaces, I am always busy pushing away the room-filling scents from my nose and brain. The appointments in the early morning are quite bad, where everyone starts the day freshly sprayed... In my thoughts I will prescribe this fragrance - "1957" - to them in the future! ... and I can well imagine that this fragrance could well become one that I would use on those days when I want to go fragranced through everyday life (without getting bored wearing it!). If I had to describe the fragrance in an equation, it would look like this in something like: "Dia Woman" + "Chanel No. 5 without aldehydes "+ a few drops of "Beige" = "1957"
With the name alone, women get nervous, extatically pull out their wallets, don't look at the price tag, don't try anything, don't care about the screams of their husbands. If a brand is already so far, it can do what it wants, because it is bought anyway. Also the (mainstream-)fragrances of the last years, which basically all did not reinvent the wheel, but were exactly that: mainstream. Middle of the road. Nothing special. Nothing really new came after Coco Mademoiselle. All' the L'Eaux and Eaux Premieres, that was only No. 5 in diluted... you could say when you smell it more closely. Chance Tendre... Fraiche...even just another packaging for the same, character, not to say unimaginative scent. But then - far away from the mainstream - the exclusive fragrances. Then there was already the one or other hit there. e.g....Coromandel - stroke of genius! Chocolate Patch. I've been thinking all day about whether to hate him or love him. There are reasons for both. Pro-57: The top note! Showery with a herbaceous undertone. Contra-57: The top note! Has little to do with the fragrance and is much too ephemeral. Pro-57: The shelf life! Sprayed in the morning, wrapped in Chanel in the evening. Contra-57: The durability! The basis is vintage No. 5 Extrait with high dose iris. Clean aldehyde story with unsexy soft musk. Too much Persil, you could think after all those hours. Pro-57: The fragrance! Unique - as if No. 5 Extrait had been reinvented, or even embellished. The Omma touch is gone, a few corners have been mixed in, exactly the kind I like: Iris said, the white guerlainesque musk, and gourmandy honey. Polge, you maitre, you! Contra-57: If you are expecting something new and groundbreaking: Wait! My decision wasn't easy, but it was made. Considering the fact that I was one of the two women (worldwide) who didn't like the current No. 5, I can now refer to the - now even better! - Variant. The best classic Chanel fragrance ever, enriched with the components that make it refreshingly new and edgy. So must the high demands on a brand! Glossy passed. Write the first Review for 1957!